Chances are you don't recognize the gentleman above, but that's Ken Kendrick, an executive with the Arizona Diamondbacks. He's also a 1965 graduate of West Virginia and a big booster of Mountaineer athletics. After John Pruett of the Huntsville Times wrote a piece last Friday that was critical of West Virginia boosters who were in a tizzy over Rich Rodriguez's departure to Michigan, the columnist got a call from Kendrick. Kendrick told Pruett that Rodriguez was "signed, sealed and delivered" to be Alabama's coach last year and in the middle of the night he received a call from a university official asking if he would intercede. Rodriguez agreed to stay, but in the subsequent months, Kendrick said West Virginia officials began to "stonewall" on promises made to Rodriguez. When Michigan called, Rodriguez was fed up. Kendrick said it's not his place to say who should be the next coach, but he's clearly worried what is ahead for the Mountaineers. Kendrick is one of Rich Rod's long-time buddies. They aren't gonna say a bad word about Rodriguez. Articles like Pruett's are revealing one side of the story, which is fine. Rodriguez has held WVU hostage two times now, the second time killing said hostage. He got that raise for himself and his assistants the first time. He got that extension the first time. He got those improvements to the stadium, locker room, and practice facility. How many times was he going to play hardball with the AD? Basically, there's another side that needs to have it's story told, and ESPN and Pittsburgh papers are failing to do so. The AD is completely dropping the ball here. And would you rather read completely one-sided articles calling Rodriguez a traitor, or would you like to have a balance in the media? Or why don't you just have your parents pay for Rich Rod's salary like everything else? RRod and Ken Kendrick had the power and support of WVU fans and alumni to address these issues and demand their change the second the Fiesta bowl was over. RRod could easily have gotten these things done. The fact is he wanted to go. And he chose to leave before one of the biggest bowl games in the programs history. This is all just PR to make him seem like the good guy in all of this. WVU's football program was riding a great wave of success under Rod and now needs to regroup and find a coach who can continue to build a great program. It's too bad for RRod. He could have gone down in history as our Bear Bryant, Joe Paterno, or Woody Hayes. Someone who was revered for building a program up over years and making it into something special. If he doesn't find quick success at Michigan watch out. Look how Loyd Carr was roasted after losing to App State and Oregon. You made you bed Rich Rod, now you get to "lie" in it. lets get an outside perspective from me. All you WVa lovers are blaming Rodriguez b/c you believe excatly what Kendrick believes: this team will go down hill fast after another year or two. but you still want to blame Rodriguez cause hes not at WVa your beloved school) anymore. why would someone as big as Kendrick say those things about WVa if they weren't true? sure, maybe he is a good friend of Rodriguez but he wouldn't lie to the world about this. Who knows when Rodriguez was going to get another oppurtunity like this. maybe never. bye-bye WVa. and you're upset soley about that and in complete denial that what Kendrick said COULD be true. 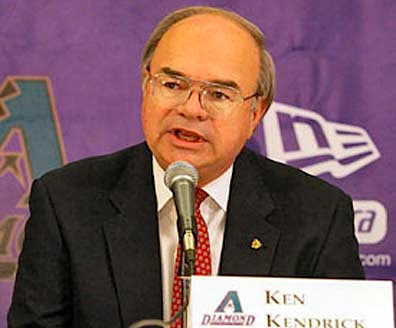 What we really have here is simply Ken Kendrick trying to take some of the heat and blame off his old buddy and trying to pin it some somebody else. With Rodriguez gone, Kendrick no longer has WVU's head football coach in his hip pocket and he's no longer considered the "power broker" of the boosters. To Boz. I have no doubt that Kendrick raises some good questions and that if true need to be addressed for the long term health of the program. What I am disappointed in is that RRod did not stay around to get them fixed and left the team at the worst possible time. Before a bowl game and 2 months before high school seniors sign their LOI. Of course there is no "perfect" time to leave a program but the way RRod left was not pretty. College football programs take years to build into something. Recruiting, relationships with high school coaches, summer camps, etc... all happen over a long period of time. Those things had come a long way under RRod and we were looking to continue that. If you can't understand why people are mad about that I don't know what to tell you. I understand this. but it was apparent the school was not holding up their end of the deal. it's been almost a full year since the RRod and the school agreed to RRods needs. Kendrick says that none have taken flight. RRod thinks the school was BSing him...i dunno. just what i can assume. he couldnt wait around another year to see if they were going to BS him again. and another Mishitagin job was highly unlikely to be around as well. with any luck, you guys will sign the CMU head coach. he appears to have the blue print and I could be wrong about WVa being non-existent in the next 1-2 yrs.